Quick crosswords are one of the most popular puzzle types in the world, and can be seen in the majority of daily newspapers. 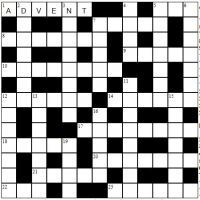 The aim of the quick crossword is very simple, but completing them isn't necessarily that easy - just answer the clues in the grid in the direction of the numbers. Clues are across and down. Some squares will be shared between both an across and a down clue, whilst others are only in one direction. Depending on the style of grid, it is possible that all squares are in both across and down answers. This is typical of the US style grid; as this site is UK based then the British style of grid predominates, so typically there will be some letters in each answer that cannot be filled in from answers in the other direction. Solving quick crosswords can sometimes be tricky as with predominantly synonym-based clues there may be more than one word that fits a particular clue - therefore in these instances you will either need an educated guess and then see if it fits with potential crossing answers, or alternatively fill in the answers to clues that you are confident only have one answer in order to narrow down the options elsewhere. Each puzzle will have clues of a range of difficulties - some are straightforward and it is just a case of thinking of synonyms, whilst others might have slightly 'harder' answers in that they may be a little less familiar or require a wider range of vocabulary in order to answer. We hope you enjoy playing our quick crossword puzzles.